The new signal tower from Auer Signal is a very special one: the Modul Perfect 70, better known as PC7, is one of the most versatile signal towers. In terms of creative design, performance, application possibilities and future suitability, it just can't get any better, according to Auer. "The perfect tone modules: the multitone module as a top or inline module and the multi-tone alarm sounder module (105 dB) for the best possible tone quality and variety"
The Modul-Perfect 70 is the successor to the Modul-Signal 70. The signal tower is structurally identical. The flat design without edges, grooves or recesses prevents dirt, dust and other residues from accumulation on the lenses and suffered in industrial settings. The signal tower is therefore not only more attractive, but also easy to clean and does not leave any form of dirt on the signal tower. The flat design prevents dirt from entering the signal tower and prevents malfunctions. 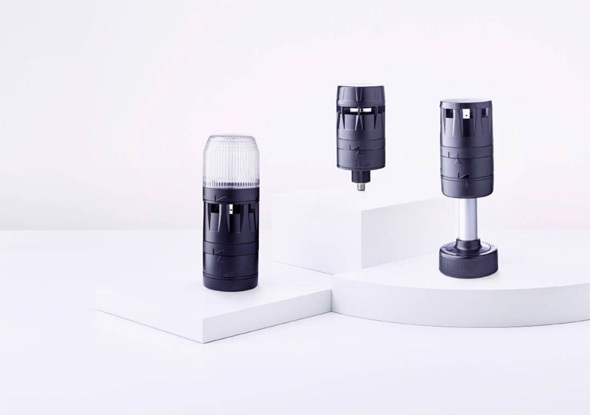 The PC7 has a degree of protection of IP66 and can withstand temperatures from -30 ° C to +70 ° C. The cylindrical form is also continued in all possible modules. Read more about signal towers an signal pillars. "Innovative voice output module for playing audio formats"
The top module of the Modul Perfect 70 is even brighter than the standard modules. Unlike the standard modules, the upper module has a hemispherical effect. This means that the light intensity of the upper module is the same at all angles of incidence. This ensures that the PC7 can be used in a larger number of applications. The top module can be combined with an inline tone module and with a basic module to form a standalone optical-acoustic signaling device. The signal tower PC7 is up to 13 times brighter than the previous model Modul-Signal 70. 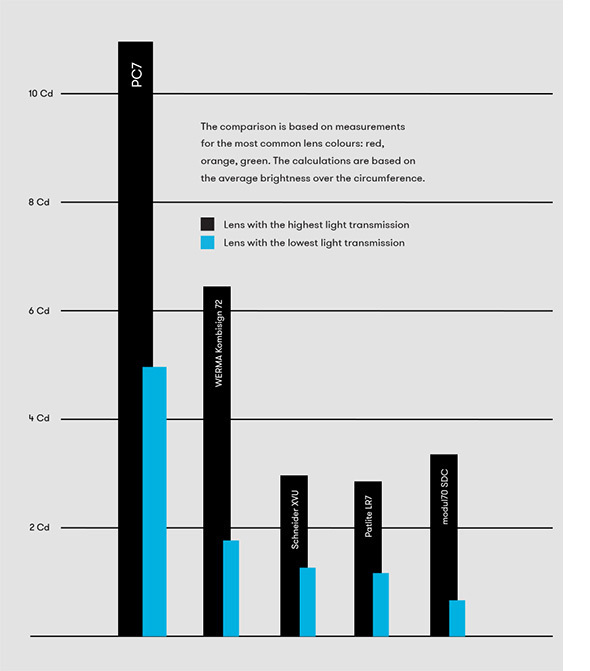 The PC7 is six times brighter than signal towers from competitors. The PC7 is perfectly visible even in conditions with a lot of light! With 7 positions, the PC7 is one of the most versatile signal towers out there. The unique, patented contact allows up to 7 positions thanks to 8 internal contacts. As a result, the PC7 is not only the highest signal tower, but also the one with the most combination options. 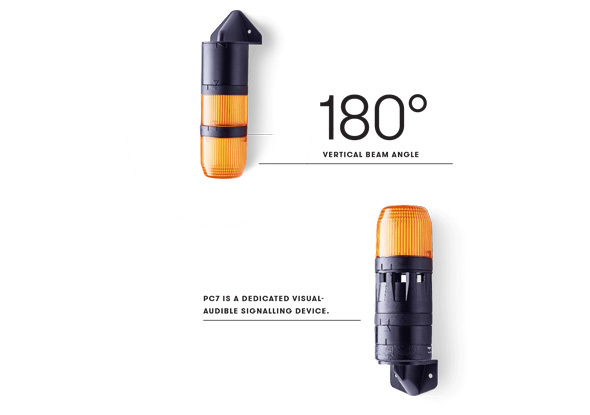 This makes the tower future-proof and equipped for every application. 7 colors can be switched externally in the LED multi-color module: red, yellow, green, blue, transparent, magenta and turqoise. Thanks to binary switching, 4 additional modules can be used in addition to a multi-color module. 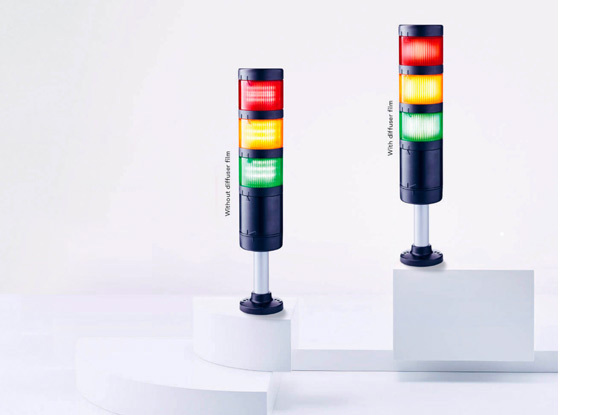 The PC7 is the first signal tower with a LED module with rotating light. This rotating light module can be operated with 2 rotational speeds - 90 and 180 rpm - via a DIP switch. The PC7 multifunction module offers continuous light, flashing light, strobe light and dual strobe light functions. The different functions can be defined by the user via a DIP switch in each module. The PC7 LED light module is the ideal choice when it comes to standard applications. But when we say 'standard', we mean functions that other suppliers only offer on expensive, high performance modules. The top module is even brighter than the standard light modules and has an extensive, hemispherical signal effect. The top module ensures that the PC7 can be used in a larger number of applications. Combine the new top module with an inline tone module and a basic module. You create a 'high performance' visual and audio signaling that can be used in a large number of applications. The diffuse films can be placed effortlessly in each individual module, even at a later time. Without changing the signal effect too much, you can choose between a clear or a diffuse signal with the help of the new diffusion foils. This allows the PC7 to deliver a single tower with two different forms. The new inline tone module of the PC7 can be placed at any position in the tower. DIP switches can be used to select one of eight tones with an adjustable volume of up to 105 dB. With the sound capsule, the multi-tone alarm module offers significantly better tone quality than the multi-tone module. 7 different signal tones can be externally activated from a total of 80 via 3 inputs. With the MP3 / voice output module you can select and play up to 7 different voice messages or melodies. The MP3 / voice output module can easily be programmed and adapted by the customer in advance via a USB interface. 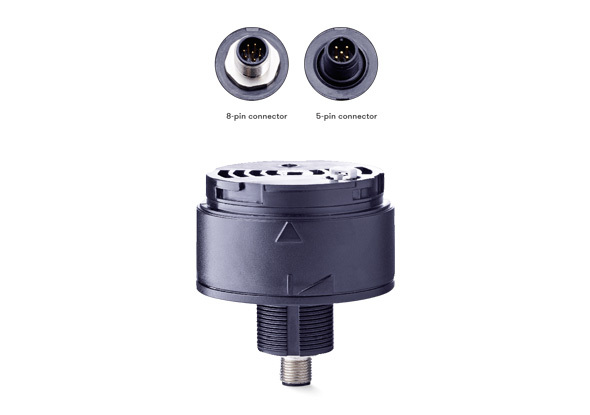 This M12 connector base is the perfect solution for applications where fast, simple and cost-effective installation of the signal tower is a top priority.